UK government plans for a new £18bn nuclear power station have come under fire from public auditors, who call it "a risky and expensive project". The National Audit Office (NAO) said the costs and risks for consumers had not been sufficiently considered. Its report comes nine months after the government granted final approval for the project, which is being financed by the French and Chinese governments. The government said building the plant was an "important strategic decision". State-controlled French energy firm EDF is funding two-thirds of the project, which will create more than 25,000 jobs, with China investing the remaining £6bn. Critics of the deal have warned of escalating costs and the implications of allowing nuclear power plants to be built in the UK by foreign governments. The NAO's report centred on the role of the Department for Business, Energy and Industrial Strategy (BEIS) in finalising the deal in 2016. At the time, said the NAO, the department's own value-for-money tests showed "the economic case for Hinkley Point C was marginal and subject to significant uncertainty". "But the department's capacity to take alternative approaches to the deal were limited after it had agreed terms," the NAO added. "The government has increasingly emphasised Hinkley Point C's unquantified strategic benefits, but it has little control over these and no plan yet in place to realise them." It added that consumers were "locked in" to years of paying for the plant. In response to the report, a BEIS spokesperson said building the plant was "an important strategic decision to ensure that nuclear is part of a diverse energy mix". The department said the project would provide "clean, reliable electricity powering six million homes and creating more than 26,000 jobs and apprenticeships in the process". The firm added: "Consumers won't pay a penny until the power station is operating and it is EDF Energy and [China's] CGN who will take the risk and responsibility of delivering it. "The project is having a major impact on the UK's industrial capacity, jobs and skills. 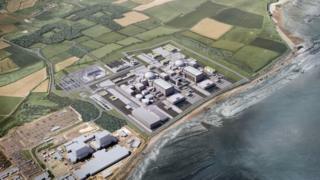 Relaunching the UK nuclear new build industry at Hinkley Point C will enable costs for future projects, in particular Sizewell C, to be lower." The Nuclear Industry Association (NIA) said the report showed that the plant was "competitive with other low-carbon projects" and that "alternatives would cost more". However, NIA chief executive Tom Greatrex added: "The NAO analysis of the strike price also highlights that using a different financing structure could have resulted in a lower strike price. "That is something government should reflect on as other new nuclear projects advance." Speaking to the BBC, Mr Greatrex said: "With two-thirds of our capacity coming to the end of its life by 2030, we need to replace that, we need to do that in as low-carbon a way as possible, we need to do that in a way where we're not overly exposed to the volatility of fossil fuel prices on international markets. Nuclear, alongside renewables and other technologies, helps us do that." "It's really important that we get new capacity built, because we've got so much that is going offline in a relatively short period of time. "We've left it a long time, and actually saying we should reassess and start again - we haven't got the luxury of time to be able to do that." Video Hinkley Point: Why do we need a new nuclear power plant?